Our course content is online, which means that you can do your self-study anywhere and at any time. However, when you enrol on a tutored course you’ll be assigned a personal tutor, so you’ll receive human support and encouragement too. OLT tutors are education specialists who’ve worked as advisory teachers, speech and language therapists and educational psychologists. Your tutor will contact you, by phone if you provide a contact number, following your enrolment to talk about your study plans and timescales. You’ll be provided with guides to help you get started, and tips for getting the most out of your course. Each course is designed to be as user-friendly as possible, but if you do need help with something, you’ll be able to email your tutor for advice. You’ll also agree a point of direct contact (phone, Skype or facetime) at a stage when it will be most helpful to you. Your tutor will be able to offer advice when you write your three SMART goals and choose the most appropriate interventions. You’ll be supported until you complete your course (usually between 12 and 16 weeks), when your tutor will issue you with a certificate of completion. Of course, you’ll have access to your course and its resources for 12 months from the date you enrolled. If a school or local authority enrols a number of employees on a course, they can opt to have an in-house specialist provide tutor support. In this situation, the in-house specialist will complete the course(s) as a participant first, and take part in tutor training to prepare them for the role. The OLT courses provide a high quality, interactive and flexible learning experience through which participants can develop their knowledge of SEND at their own pace. By applying theory to practice and setting SMART goals, participants can achieve successful outcomes for pupils with SEND in the classroom. The forums are a great way of sharing experiences and collaborating with others. The videos offer good examples of inclusive practice in different settings. Linda is a qualified teacher with qualifications in dyslexia, speech and language difficulties, autism and AAC. Linda has extensive experience working as a peripatetic advisory teacher with a local authority. During this time she became an OLT tutor, enthusiastically delivering courses to teachers and teaching assistants within the authority. Linda has always been passionate about the use of assistive technology to help children overcome learning and communication difficulties, which led to her role as Specialist Coordinator for AAC (Augmentative and Alternative Communication). In 2015 Linda was awarded an outstanding achievement award for her work in helping children and young people with severe communication difficulties to express their voice and communicate. OLT courses are a great way to increase your knowledge, they encourage you to reflect on your current practice and develop enhanced support for the pupil. The content is interesting, varied and presented in a variety of ways to creatively reinforce your online learning experience. You can work at your own pace, revisit content, discuss ideas and thoughts on the forums, and you have a personal tutor to offer support when you need it. Lynda is a qualified Teacher of Deaf and has spent 40 years working in all areas of educational provision for deaf children and young people aged 0-18. During this time she managed a large service for deaf children, then services for children with hearing, visual and learning difficulties, and a team of counsellors supporting children with disabilities. Following this, she took a role in the voluntary sector, providing advice and training. Lynda has also worked in a school for deaf children in the Gambia and produced training for other African countries. Until recently, she was a governor in a local mainstream school, and is now volunteering for a local charity supporting training courses and mentoring. Lynda has had a hearing impairment all her life and wears two hearing aids. The OLT courses combine a range of user-friendly learning materials with the flexibility of self-study. The videos and case studies provide real-life examples of inclusive good practice for children and young people with sensory impairment. The tutored courses provide a complete learning package through a combination of online resources, together with forums which provide an opportunity to discuss practice and experience with cohort members, and support from an allocated tutor for personal support and encouragement. Jan has over 35 years’ experience working in schools, local authorities and the voluntary sector with children and young adults with sensory impairment. She is a qualified teacher of children with hearing and visual impairment, and also a qualified mobility teacher. She has specialist skills in the provision of services for children and young people with sensory impairment and additional disabilities, and has worked in the field of multisensory impairment for more than 25 years. She has a particular interest in the development of training materials; being the co-author, course tutor and external examiner for a range of accredited courses in MSI and working with children with sensory and physical disabilities. For me I see many advantages of OLT, not just its accessibility and flexibility. It has, at its heart, the philosophy of inclusion, encouraging and enabling staff to adapt their practice to meet the needs of the pupils and young people they support. Feedback from participants has frequently mentioned the powerful and sustainable impact the course had on them, and on their learners through the review and evaluation of SMART goal setting over time. I feel privileged to tutor these highly sought-after courses. Rod is an Educational Psychologist (EP) and an accredited VIG (Video Interaction Guidance) practitioner. During his time working as an EP for a London authority, he developed an interest in Autism and took on a specialist role. This led to him training as an OLT tutor, delivering courses within the authority to 550 members of staff. Rod has tutored participants from nursery to post 16 settings, with a wide range of staff, including teachers, mealtime supervisors, Learning Support Assistants, Inclusion Managers, SENCos, Speech Therapists, advisory teachers and EPs. 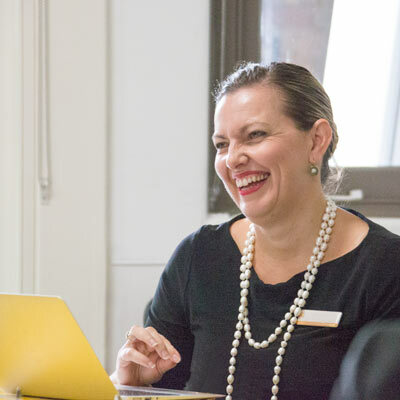 The OLT Vision Impairment (VI) course is a positive experience, which provides a clear structured introduction to the breadth of knowledge and skills required to support the successful inclusion of children with VI. OLT training provides a creative and interesting way to further your understanding of the specific and individual needs of children with visual impairments. The videos offer excellent examples of good inclusive practice. Gwyn is a qualified Teacher of Visual Impairments (BPhil. Spec.Ed. V.I. Distinction) Qualified Teacher Status (Cert.Ed.). She is an enthusiastic, passionate, committed and motivational individual, with a wealth of experience and knowledge in the field of education and visual impairment. She has a clear understanding of inclusion from the School, Service, Child and Family perspectives. OLT courses provide an excellent learning platform to develop and enhance knowledge and skills in relation to sensory impairments.The videos and case studies are relevant and thought provoking and support the learning process all they way through making it interactive and fun! Over my teaching career I have held many posts - head of service(s), advisory teacher and classroom practitioner. Throughout that time I have sought to emphasise and celebrate the importance of continuing professional development and have worked closely with universities and voluntary agencies to support placements, course development and training. The OLT blended learning courses are fantastic for professionals supporting learners in any education setting. They are engaging, enjoyable and never boring. There’s a great mix of content to enhance inclusive practice, including immediate take-away strategies, and longer research articles for in-depth study. The videos show examples of inspirational leadership and practice, and the forum discussions and group sessions encourage reflection and sharing. Setting SMART goals ensures learning is put into practice to improve learning outcomes. Jacqui is a Director of OnLineTraining, training and supporting course facilitators and developing partnerships. She is a qualified teacher, has been a SENCO and a teacher-in-charge of an ASD resource, and has been involved in school governance for 20 years.